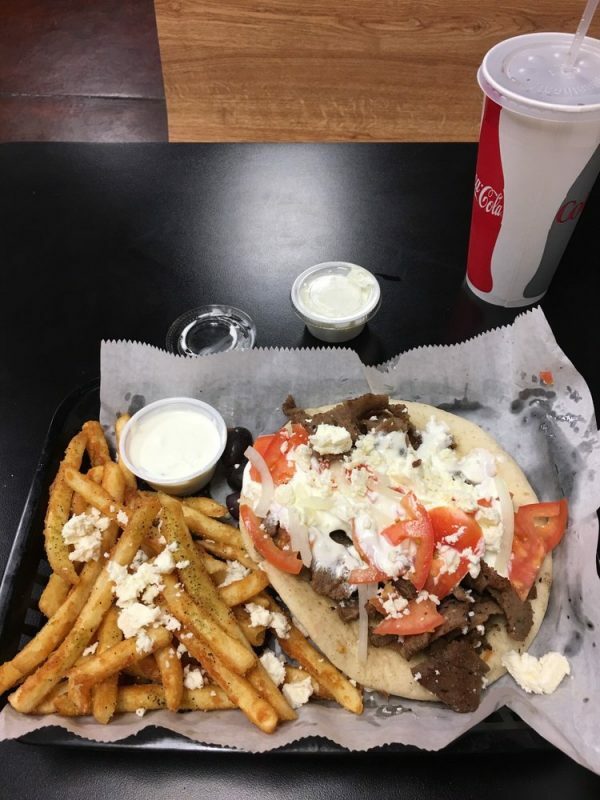 By Grace Nordquist–“Greek to Me” is a great place to get authentic Greek food at affordable prices. They serve everything from gyros to salads, burgers, sandwiches, and more. The inside is small but inviting, seating roughly 40 people comfortably. Small, Greek themed pictures are hung on the walls above the tables, giving the shop an authentic feel. It seems the goal of the restaurant is to make customers feel they are eating real Greek food in a traditional setting. They even serve a popular Greek pastry: baklava. The restaurant is located at 5714 Sunnybrook Dr. and is open Monday-Saturday 11 a.m.- 9p.m. and Sunday 11 a.m.- 5 p.m. The restaurant is casual, with a drive through option and order first/take a number style seating. On a Friday evening it was fairly quiet, with only three other couples eating inside. I ordered an original gyro without tomato, and made it a combo with a side of GTM (Greek to Me) fries. The meat on the gyro was tender and fresh and was some of the best lamb I’ve ever had. The pita shell may have been homemade, or at least heated well, and had a good mix of crispy and soft. The Tzatziki sauce had small chunks of cucumber cut up, which I thought would be bigger, but the taste was good. The GTM fries were fresh, golden fried with some sort of seasoning. I enjoyed them but thought they could use a little more of the seasoning. My friend Mo ordered a pizza gyro with cheese balls. The pizza gyro was something neither of us had seen before and Mo described it as “fun.” We didn’t know what quite to expect. When it arrived, it was the same pita bread used for the gyros (a single piece) topped with pizza sauce, lamb, and cheese and cut in triangles like a mini pizza. It was different, but the toppings complimented each other well. The cheese balls that were on the side we both agreed were a little off. The batter on them was not very good and seemed a little burnt. We thought maybe they were fried in old oil. Mo added they could’ve used a side of ranch. Overall, I would give my meal an 8/10 rating. It was affordable, authentic, and the food was fresh and tasty. I would give the service a 10/10, as they were friendly and the food came fast. I would give the atmosphere a 9/10 rating. It was small but had a cute Greek vibe to it. Mo and I enjoyed our first experience at “Greek to Me” and would recommend it for anyone looking to try something new. Next Topic: Is Captain Marvel Worth Watching?